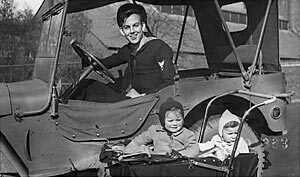 "I was one of hundreds of American Sailors shipped in to Exeter serve at the U.S. NAVAL SUPPLY Base, code named JOWL-93. My group arrived in September 1943 and were billeted for a short time at the Royal Marine Barracks in Topsham and then when some Quonset Huts were built we moved on to what had been a beautiful golf course. We turned it into the epitome of a mud hole. In my Quonset Hut of 28 men, 25 were either immigrants or first generation; one lad, Bob Huntley, was born in Bristol. In the adjacent hut were two men both of whom had won German Iron Crosses in the First World War and their mates never really trusted them. For the next eighteen months we worked long hours doing logistic work for the D-Day Invasion. Recreation for enlisted men was mostly non existent. 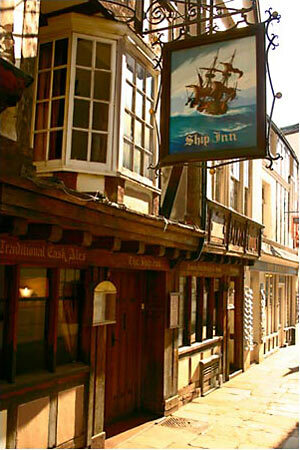 Most nights I got a ride into Exeter and found a seat at the Ship Inn and after a few pints went over to the area of the Railroad Station (Central Station?) for the greatest Fish and Chips ever produced; this was followed by a long walk back to the Supply Base. We had two British technicians installing our communication equipment and they drove our people crazy. We wanted them to do a fast bare bones job that would get our communications up and running, but they insisted on perfection for every minor piece of work and every union sanctioned tea break. The cultures didn't clash we enjoyed the differences. One family named, as I recall Chick, invited me to their home. Their attractive blonde daughter was rather interesting. They were an exceptionally nice family and they took my mate and me to Torquay for the day. I enjoyed it, but looking back it had to be difficult for my hosts. They really did a nice thing, but there was a generation gap, and a very wide culture gap in that they were well mannered and we were, for the most part, too young not to eat pie with our hands. It must have been a tortuous day for them. Lastly, an amusing aspect of duty at Exeter. We were corralled behind barb wire fences and seldom given Liberty during the day. In the meantime the Italian Prisoners of War were walking down Topsham Road (?) free as birds with complete freedom and no work to do. About five of my crew were Italian so some conversations took place that I never understood. Many years later my genealogy research indicates that my family came from the Continent in 1066 and settled in the Devon Area. We know for sure that Robert arrived in Boston prior to 1644. There are also indications that we are related to Thomas Moon who Captained one of Sir Francis Drakes ships. It is recorded that this Captain Thomas Moon drank with Drake at the Ship Inn. 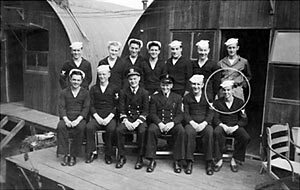 I wish that I had known more of my family history when I was stationed in Exeter so that I would have had a chance to document some of these connections."